Two Words: UN, REAL. 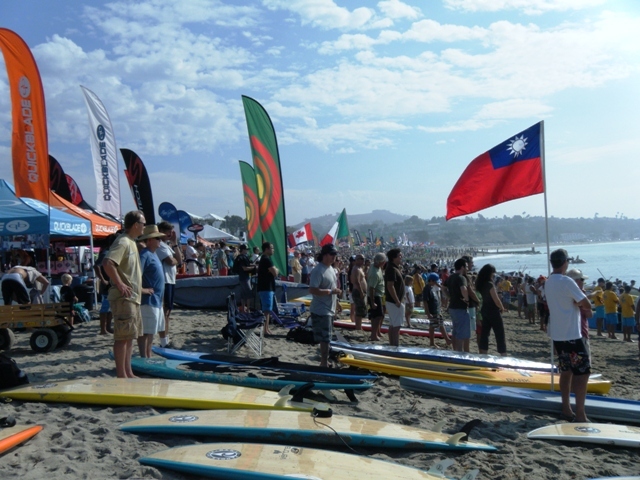 Thousands of Paddlers, to include the best of breed, gather in Dana Point, California annually for this “world series of paddling” event. 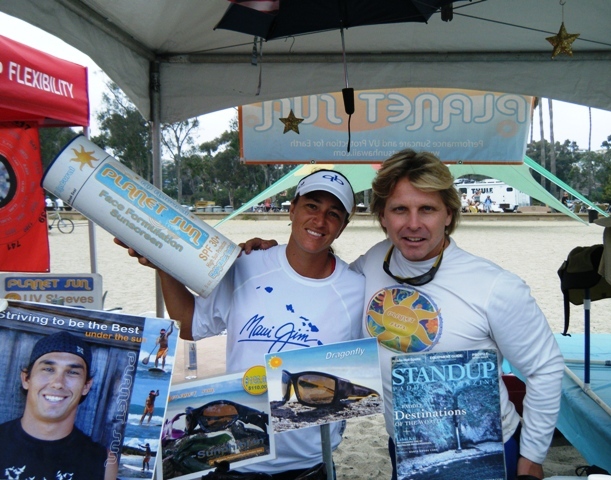 Mr. Sunshine on site with suncare offerings- stoked to be part of it, and Planet Sun Waterman hero Duane DeSoto competed. 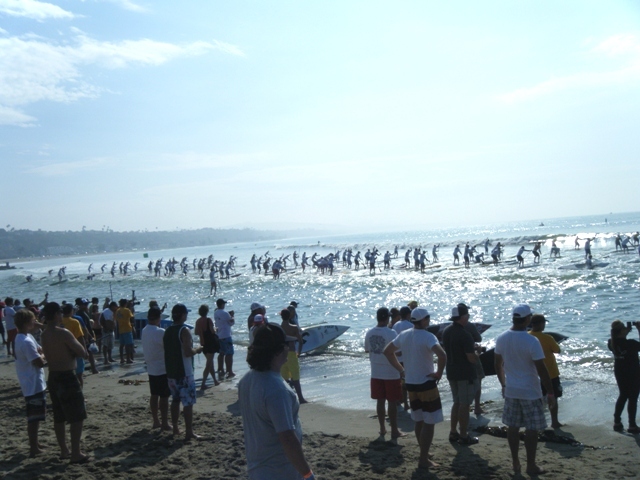 Staged at Doheny State Beach, the event boasted a 2 day venue of distance, sprint, and relay races. Delicious SoCal backdrops, bods and vibe all included free of charge – see the first pic. 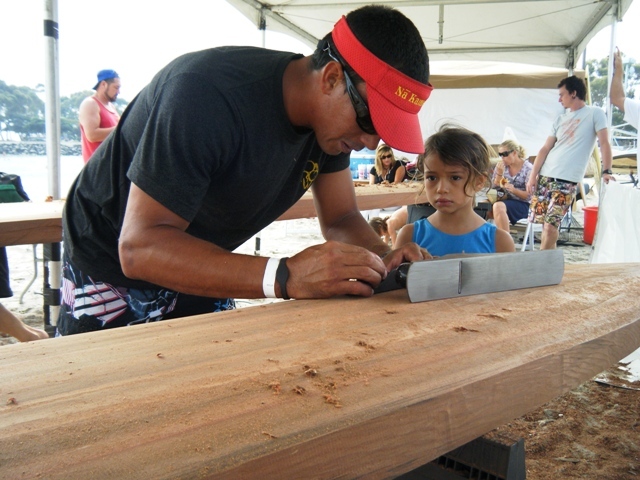 On the front side and periphery of paddling competition was an overly impressive expo and world class cultural events- Traditional Hawaiian Blessings, Dance and waterman craft. 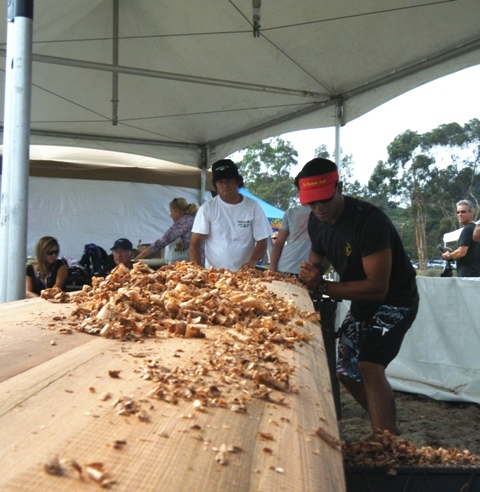 Tom “Pohaku” Stone, a legendary native Hawaiian waterman, was the soul for much of the activities. Among many efforts, Tom inspired all with his knowledge and craftsmanship while carving surf boards out of wood reclaimed locally from 100 year old wine vats- sweet to the sight and smell. Duane DeSoto aided in hand planning efforts- a pic of the goodness attached. The paddling competition was spectacular. Friends of Planet Sun- Candice Appelby won the Elite Race, and Andrea Moller claimed third overall honors for the women in the Distance Race. Both ladies in rare athletic form, epitomizing the sport. 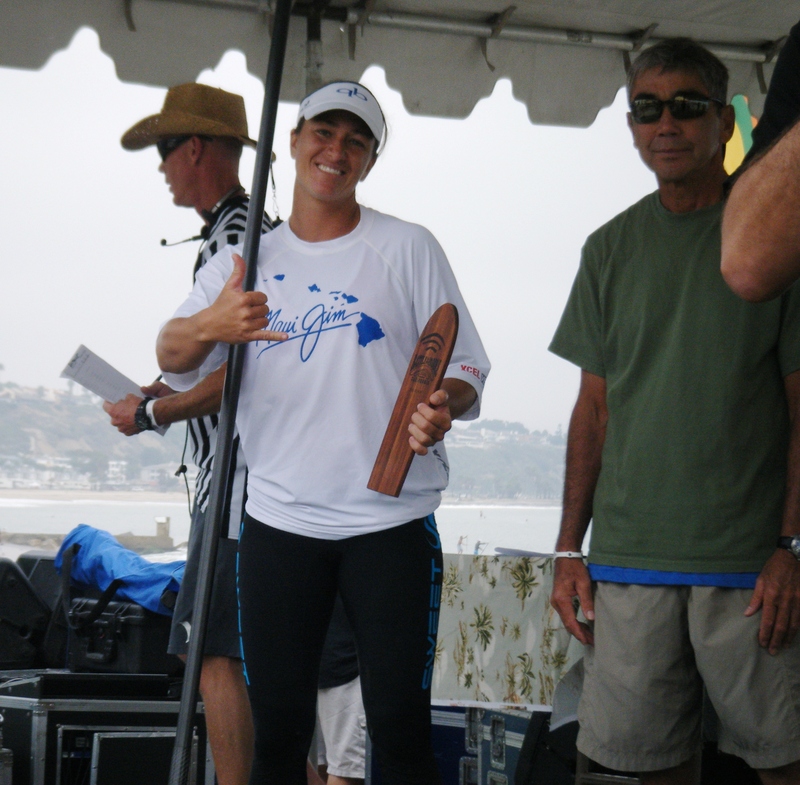 Andrea on a unimaginable streak of paddling perfection this year, having also won the great Molokai to Oahu channel, “Channel of Bones”, paddleboard race in record time. Planet Sun also premiered two new products at the event- our DragonFly top water sunglasses and Formulation Two Performance Sunscreen. The DragonFlys, a follow-on to our Sunphibian sunglass features all the goodstuff attributes we put into the sunphibs and boasts 2 removable leashes. Formulation Two sunscreen is our new Zinc Based body sunscreen with “On Board Nutrition” featuring Green Tea Extract and Hawaiian Kukui nut oil . Both products set for global release in mid-October. Watch for press releases and worldwide excitement. 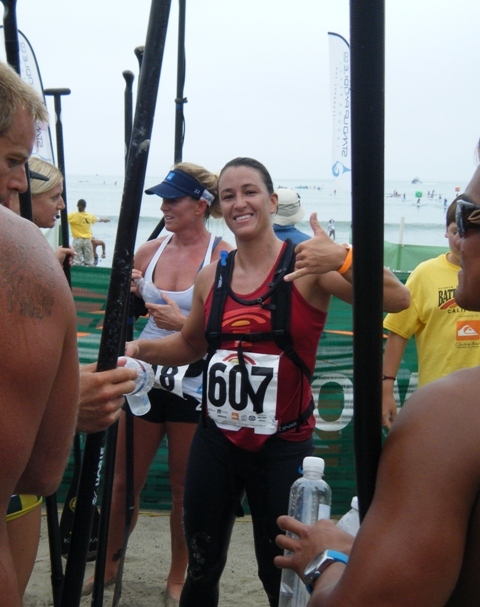 Shonny Vanlandingham crowned 2010 XTERRA USA Pro Series Champion. Oh yea, she did it… Shonny Vanlandingham placed an overall third at the recent XTERRA USA Championships. Shonny’s performance here, coupled with here other 2010 victories, earned her enough points for the US Pro Series Title. Shonny now focused on the upcoming XTERRA World Championships in Maui. Us too. You Go!! Kaneohe Bay Air Show. 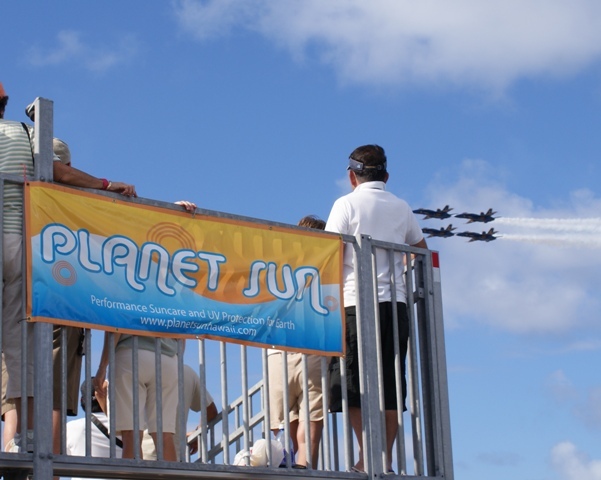 The Blue Angels and about 20,000 spectators in the Hawaii Sun- our kinda party. 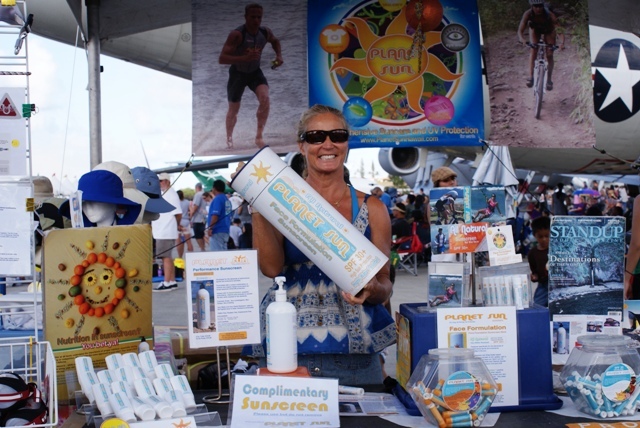 Planet Sun proudly sponsored this event, providing suncare relief for the over-exposed masses on the Kaneohe Marine Corps Base Airfield. Planet Sun Triathlete Abby Mason and waterwoman extroidiare, Sonja Evenson on site to share the good stuff. IronMan World Championships in Kona, and the XTERRA World Championships in Maui. Planet Sun heroes now peaking and ready for action. Sandy and Mike Ferreira on the start line in Kona. Planet Sun in full fun fest at XTERRA: Amy Eck, Shonny V, Trish Havey to take on Haleakala at XTERRA World Championships. Na Kama Kai Ocean Clinic: 10 OCT, Pokai Bay, Oahu . Ocean education, stewardship and watercraft training for the Kids- free of charge. Kahala Challenge: October 23rd, 2010 at Kailua Beach Park, Oahu. Swim, Run, Paddle. Planet Sun happy to support this unique ocean sport event featuring an 800 meter swim, 2.5 mile beach run, and a 2 mile paddle board or stand-up or a 4 mile one-man canoe paddle. This entry is filed under News, Press Releases. You can follow any responses to this entry through RSS 2.0. You can skip to the end and leave a response. Pinging is currently not allowed.